order it online at the UCSC store. 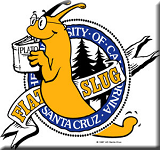 You can get the UC Santa Cruz Banana Slug t-shirt, worn by John Travolta in Pulp Fiction, at the store called Made In Santa Cruz. You can get it online or in Santa Cruz at Made In Santa Cruz. You can find in on line at www.madeinsantacruz.com. We can ship it to you for a small fee. Check it out on our website?